Rottweilers make loyal, devoted and brave pets. Rotties as they are affectionately known are happiest when having a job of work to do. This is one of the reasons they make such effective guard dogs and will protect their family to the death. 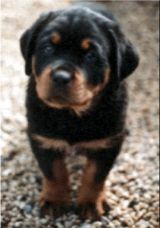 This means that Rottweilers need very early and consistent puppy socialising and training. It is not generally recommended that inexperienced handlers consider this breed. The Rottweiler is basically a calm, confident and very courageous breed, having a fearless expression and a self assured aloofness, it does not generally lend itself to immediate and aimless friendships. 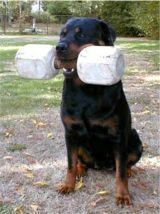 Rottweilers have a strong eagerness to work, and are not expected to submit to excessive handling by strangers. Rottweilers were originally Mastiff type dogs brought through the Alps by the invading Romans into what is now Southern Germany. They were used as cattle drovers and for guarding food supplies for the legions at night. Remaining dogs continued to work, long after the Romans had been driven out. The butchers of Rotweil in Germany, used the German Rotweiller for centuries to drive their cattle to market and protect their money bags on the way home, they tied the bags around the necks of these fearless dogs. Rottweilers became known as the butchers dog. Our 4 Paw Rating - to the suitability of Rottweilers for your home and lifestyle. Firm, assertive and consistent training essential from early puppyhood. Rottweilers must also be trained not to pull on the leash, as they grow into very large, powerful dogs dogs! Discover How to make your Rottweiler happy healthy and obedient!